Hello everyone, and happy last day of 2013! We have a cold New Years Eve/Day in store this year with temps rising only into the low teens or single digits during the day and falling well below zero at night. Clear and cold conditions will dominate today’s weather while clouds associated with our next storm system will begin to arrive Wednesday. Snow begins early Thursday morning and likely lasts through Friday midday. Snowfall will be light Thursday before becoming heavier Thursday night and lightening up again Friday morning. 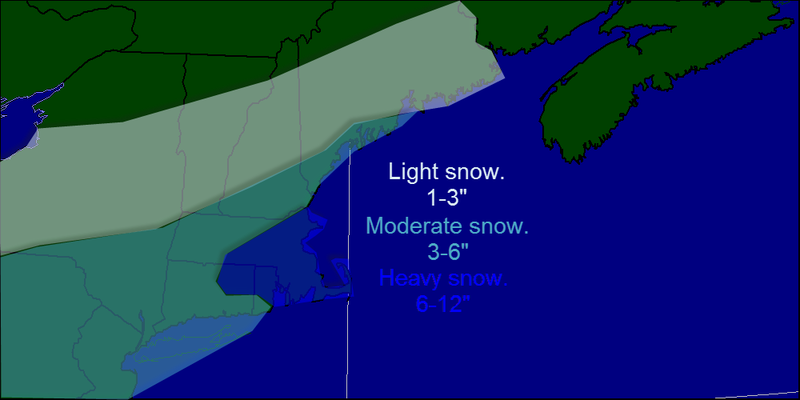 I expect the heavy snows to affect primarily MA, RI, and parts of CT. This one will be for our friends in southern New England. Snow will move out Friday from W to E leaving close to a foot on the ground in parts of SE MA while most of the rest of Southern New England gets closer to 8 or 10″. The exception to that will be over SW CT where less liquid will fall thus less snow so I left them in the 3-6″ range though 6″ is more likely than 3. Across Northern New England, Southern Maine and New Hampshire get the “jackpot” for this one with 3-6″ heaviest along the coast. Down east and the foothills get 1-3″ while the mountains completely miss it getting only flurries. The snowfall map is below. After this storm, one more shot of arctic air rolls in for Saturday before warming into the 20’s Sunday. The next chance for snow or mixed precip will arrive Sunday into Monday. Cold midweek, next snow chance arrives Thursday. Today will feature the passage of a strong cold front in the morning hours followed by some gust NW winds. These winds will usher in much colder temps that will dominate headlines this week. Temps for Tuesday through Saturday will not get above 10 or 15 degrees. The other story we are watching is the chance for another storm system late this week. There is a disturbance over the Pacific ocean now that will move across the US this week. This storm will join forces with another storm that is currently in Mexico. The questions in the forecast are regarding the proximity to the coast and the intensity of the low. 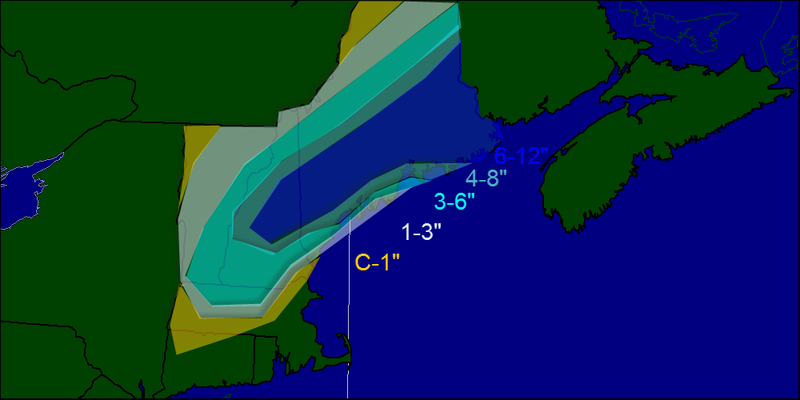 As of now, the storm’s big impacts will be focused in Southern New England closer to the low. At this point it is far too early to say what exact snowfall amounts may be but a light snowfall event is likely across Maine, New Hampshire, and Vermont where Massachusetts, Rhode Island, and Connecticut are more likely to see significant snow. The timing surrounding this will be Thursday mid morning through Friday mid morning/early afternoon. It will be a long duration event however, snowfall rates will be lower resulting in an easier job for road crews. Beyond this storm, another snot of arctic air invades for Saturday followed by a warm up (20’s) and the possibility for more snow Sunday. Our next storm is approaching the region this afternoon and precip is already well underway across CT, RI, and MA. This will spread northward into NH and ME later this afternoon and in to this evening. Precip should initially start out as rain especially near the coast but should change to snow later this evening. Above is my thinking regarding final snow totals. 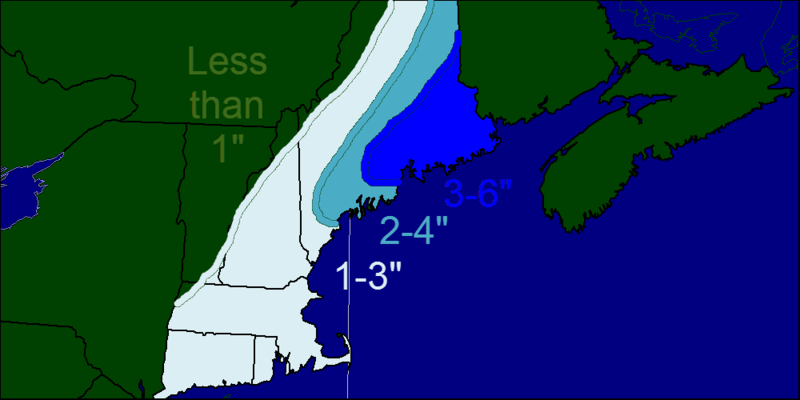 As you can see, a very sharp drop off is expected along the coast depending where the rain/snow line sets up. After the storm departs early Monday morning, NW winds will become very gusty with winds reaching 25-35 mph. Looking ahead, were back in the freezer this upcoming week with temps barely reaching 10 during the day and plunging well below zero at night. Our next storm potential looks to be Thursday into Friday. Tomorrow night will feature our next storm system bringing with it rain and snow. Tomorrow we will see temps in the 30’s and 40’s so as a result the precipitation type forecast is rather tricky. 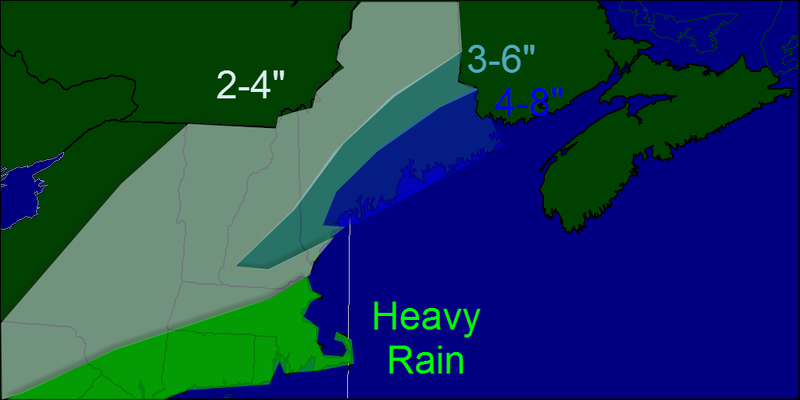 My current thinking is that coastal areas see a mix of rain and snow accumulating 3-6″ while inland areas see lots of heavy snow adding up to 6-10″. The mountains see less because they are farther away from the storm. I think that they get 3-6″. 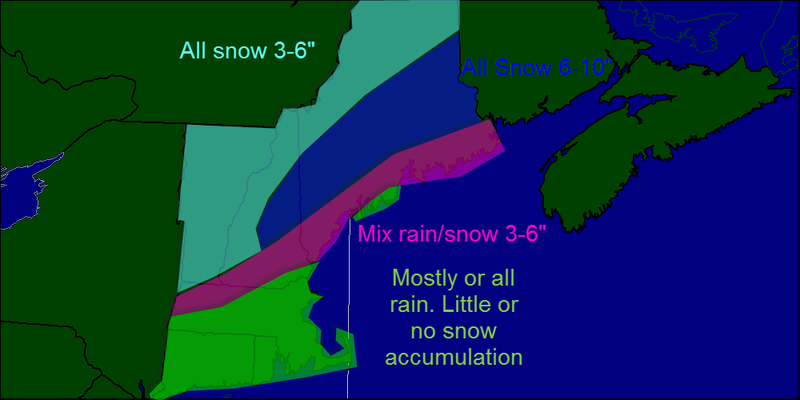 Above is my thinking as to the precipitation type and and snowfall amounts. After this storm, gusty NW winds will bring in very cold air. The next chance for a storm will show up late next week. There has been a lot of hype regarding this mornings model runs. I urge everyone not to pay any attention to those screaming over 1 run and keep in mind that this run is an outliar. We will continue to monitor the latest forecasts so stay tuned. After a light snow event yesterday, we are headed into a warmer pattern for the next few days as winds turn to the southwest. Temps will rise above freezing today into the 30’s and will hit 40 in some spots Saturday and Sunday. 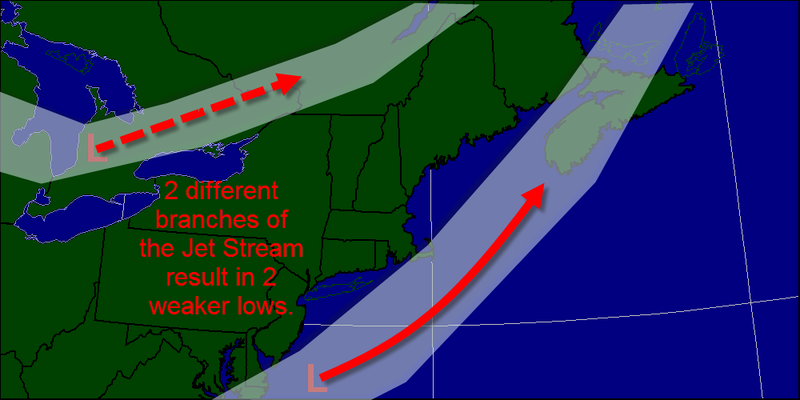 The map above shows how the 2 lows in the 2 parts of the Jet Stream will stay separate resulting in a weaker coastal low. Anticipated snowfall accumulation through Monday Morning. Today we have a clipper system moving through that will spawn a coastal low offshore. The result will be a period of light snow that will produce about 2-4″ of snow across coastal and midcoast Maine with 3-6″ downeast and 1-3″ across most of the rest of New England. The exception may be cape cod where rain may mix in. It will not be a lot of snow but just enough to make things slick. Given the amount of people traveling today, expect some small delays here and there. After this, cool temps will dominate through the weekend when southwest winds will warm things up. Our next chance for a storm will arrive Sunday with a coastal low. Today will be an interesting one across the area with freezing rain developing and becoming heavy at times. As of 7 am, there was a trace of ice on the ground in Yarmouth while areas to the N/NW are reporting generally a quarter inch of ice. I expect that those areas being impacted now will have the highest chance of hefty accumulations. Along the coast north of PWM and points west, 1/2 inches or more can be expected while York county gets around a 1/4 inch. Current radar shows a band of heavy precip moving across Cumberland and York counties and more back to the west. Precip will begin to fill in later on this morning and become heavy as low pressure approaches the region. After this wave of low pressure, we get a ‘bonus’ round tomorrow morning. The same setup will be in place with cold air damming across the region and warm air aloft so freezing rain will again be the dominant precip type. New accumulations of 1/4″ are likely with that storm. It all moves out to sea Tuesday with icy cold air in place for Christmas.